It all looks a little scary in light of what we recognize as a medical facility today. But me, being old(er), I can remember these types of things in my doctor’s office when I was a kid. You got your shots from a reusable, sterilized syringe and needle. This type of white cabinets held a lot of scary looking stuff when you were little. 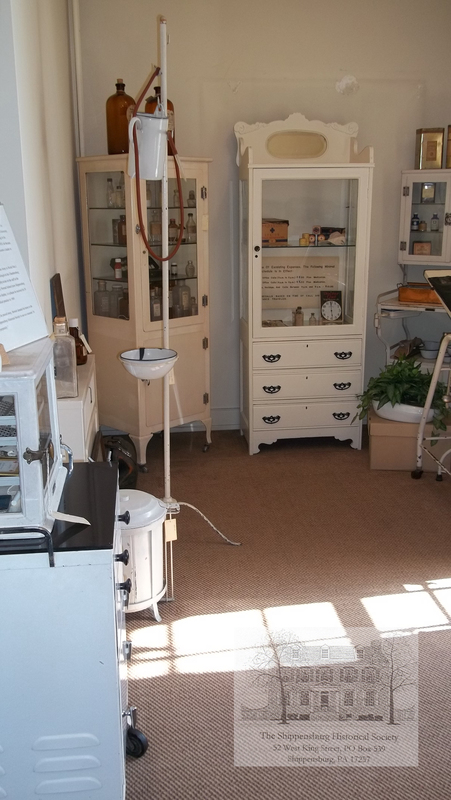 This step into our medical past is located at Shippensburg Historical Society, http://www.shippensburghistory.org/ https://www.facebook.com/ShippensburgHistoricalSociety Dr. Alexander Stewart was responsible for us having his home to use to house our collection, and also donated most of the items from his office when he stopped practicing in 1963. He went into practice in 1920, was a general practitioner for a few years and then returned to school to study the new technology of the time: radiology. He was the first doctor to use x-rays at the Chambersburg Hospital. His rates and those of another doctor of that time are on display. 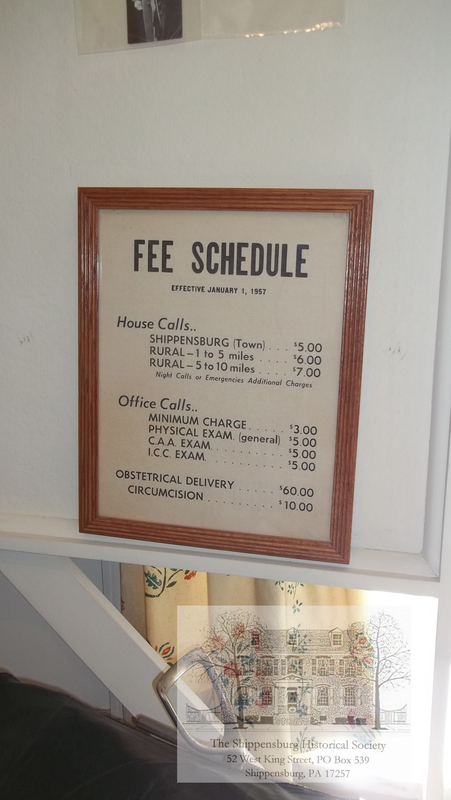 These rates are for house calls; yes, the doctor came to your house……! We have the doctor’s house call bag, as well as those of several other doctors who retired and gave their bags to us to preserve as history. 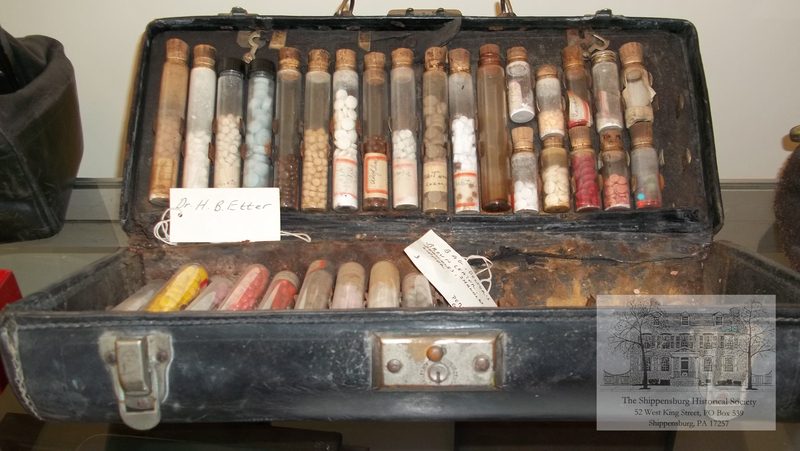 We also have various bottles with medicines from drug stores of that era and before, including things from Altick’s Drug store, which was operating in town during the Civil War. If you’re local, or coming to Shippensburg, you should check out the many interesting displays of our local history at Shippensburg Historical Society. We are open to the public Wednesday, Friday and Saturday afternoon from 1-4. 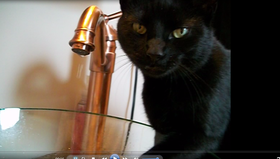 Wow, what an interesting collection you have, I am glad you posted the photos. Thanks. I’ll be writing some more blogs about the neat stuff in our collection. What wonderful captures! They bring back memories of when I was a kid. I remember when our family doctor made house calls! I haven’t thought about that in years. There is a doctor’s office/pharmacy at Mystic Seaport that is very interesting. They did a wonderful job recreating things exactly as they were in the 1800’s. I think it’s so important to preserve things like this. Thanks Jackie. It is important to preserve these things, and I love our historical society and our local history. I’ll write some more stuff about our collection. Didn’t your doc have those white cabinets too? It was intimidating to go in there as a kid, and it smelled funny, lol. It is a little scary Sam, looking at what medical treatment was during that time. Well yea, Sister Hippie, come on up here! But wait till summer.